After months of searching and hunting, FINALLY we had our venue confirmed. Initially we wanted to hold our solemnization in our Secondary School. Sound cool isn’t it? We met there, we dated there. What a memorable place for us. We somehow or rather had already mind fixed to hold it there. However, after meeting with the principal, it seems like we have to call off this plan because of some restrictions here and there. (And we really don’t understand why.) Trust me; we were completely lost at that time. And we have to face the fact that we ought to change our venue. That’s really upsetting. Many had asked why we separate our solemnization and banquet mainly because we can actually do it together in a day isn't it? Save money and hassle free. Yup, of course we know that. Because we couldn’t really confirm the actual wedding date (though we somehow or rather had already set the date already – March 2014). But looking at the date now, many of the hotels have already fully booked till next year. Sound scary uh? So most likely we will postpone the banquet. And if we were to hold solemnization and banquet together, we would probably need to settle everything within first or second quarter of 2014 as our flat is said to be ready by June 2014. We need the ROM certificate to prove that we are married right? That is why we wanted to separate both solemnization and banquet. So currently, our plan will be ROM first, followed by banquet then followed by moving into our flat like what most people did. Some people might want to hold their banquet after flat is ready because they wanted to have 二人世界. And most people did not because of the money stress and mental stress that everything will be coming together within a few months We never expect to be that fast as our flat is building faster than we expect. (It is already building their nine stories!). Lol. So an advice to all who are still waiting for the flat. Even though they claimed that it will be ready by 3 or 4 years later, usually it is just 2 years plus. (Unless something cropped up. Choy!) Plan ahead! 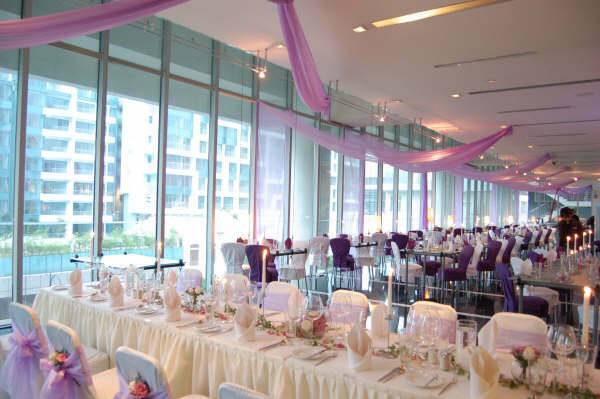 Talking about solemnization venue. We have went to a few of site inspections. 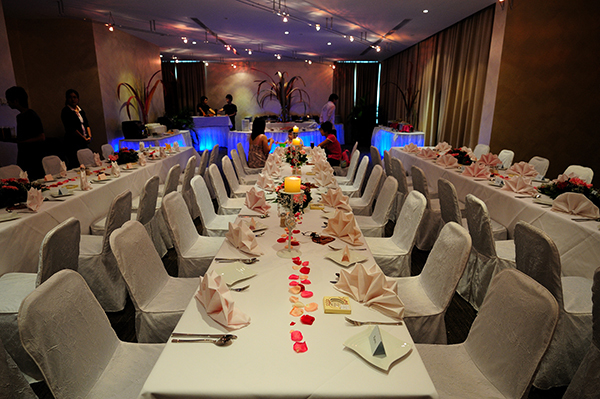 There are lots of rave reviews about this hotel for solemnization. Mainly is because of the man-made waterfalls at the Waterfall Lounge. The outer look of the hotel looks quite old (In my own opinion). Albert is the one who attends us. He is really very friendly. Quite a nice guy. He brought us to the Waterfall Lounge which fiancé literally “Wow” when we stepped in. I must say that the waterfall is really beautiful. He likes this place because it has the “outdoor” feel. Albert explained the package to us and we thought that we were quite confirmed with the package cause fiancé really loves that place. But we still decided to go for a few hotels hopping first before confirming anything. - Children is between 7 – 10 are charged at 50% only. - Full length window with man-made waterfalls. - Wedding gifts for the guests. - Exterior of the hotel looks old. - Room accommodation is not included. - Have to share the lounge with their guests (if any) unless you have lots of guests then they will let you have the whole lounge instead. – I am quite particular about this. Haha! Melissa is the one that attend to us. She first brought us to the poolside garden which I am quite interested in. However, fiancé totally turned off by that place. Full of mosquito and was rather humid at that time. He is a 汗宝宝, you see! Haha! We cannot go for a outdoor solemnization specially when we wanted to hold in the afternoon. He will be so pekcek by then to say “I do”. Haha! Anyway, they have lots of packages and one of them will be having the buffet at the market café. And I was rather turned off. We don’t like my solemnization to be opened to the public. We like it to be private and cozy kind. So in the end, we rejected this hotel. - Their function room is so much better if you are looking at holding there. - The hotel looks quite grand. 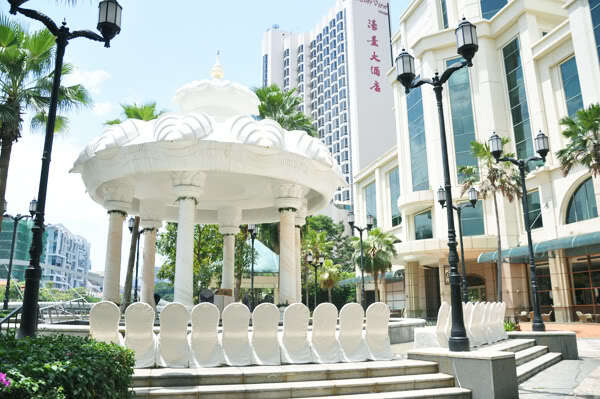 - Near to Clarke Quay MRT. - Poolside Garden has lots of mosquito. - Additional cost if you wish it to hold at the poolside. - Pool is opened to public even when you are having solemnization at that time. When we were there, we heard children screaming, water splashing. If you need some special sound effect, you can consider. Haha! - Ellenborough Market Café is opened to public. Sharing the same food with the public. We love the feel when we stepped into the lobby. Dennis is the one who is attending to us (Not a very experience person I would say). He brought us to the function room which we were quite shocked. Extremely small. Though he said that the room can be extended. He did not try to extend the other function room for us to view at all. It is kinda hard for us to imagine how it is like. Anyway, we walked past their ballroom and I really love it. Maybe can consider having my banquet there instead. Haha! - Lobby is very grand. - Simple floral decoration for solemnization tables and guest tables. - Wedding gifts for the guest. - Good location. Near to Bugis and City Hall. - Function room is quite small. Lots of good review regarding the place and the food. Jacklyn is the one who served us. She is really friendly and humorous. Kind enough to throw us lots of perks. Really appreciate. She is so patient and shows us all their function rooms. And even allow us to use the bigger one instead. She gave us lots of idea like doing it in long tables instead of round tables and we thought that it can be quite nice. (Harry Potter Style) Haha! - The food looks yummy! Lynn is the one that attends us. She is friendly and gave us lots of advice. She brought us to the function room which we were not very pleased with it. Not sure why. Probably it is located at corner. Very corner those kind. And she brought us to take a look at their promenade which cost additional $888++. I have to say that it look really beautiful and romantic. It is like when the solemnizer pronounce you as Husband and Wife, the water fountain will start splashing water down. Woah! Damn romantic! 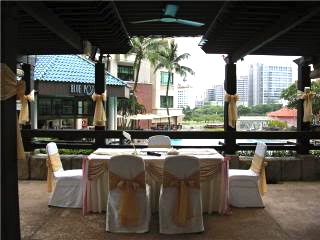 However, even if it rained on the day itself, you will be transfer to their function room. However, $888++ is not refundable *SHOCKED* $888++ for a very unpredictable weather. Forget it. 幻想就好! - Children (Below 12 years old) is charged at $55 nett with personal 3 course meal. - Floral arrangement for reception and dining tables. Congrats! You two look great! So happy for you! first congrats on your ROM ! I came across your blog when I googled on photoshoots in schools. I met my boyfriend (and of cos husband-to-be) in sec sch too and was thinking of going back for the ROM ceremony (just using a classroom, definitely not the whole place haha) but you mentioned schools don't allow such practice ? hmm... why ? Cos i read before that couples have done so b4 (i think that was Temasek Pri, free publicity for school also !). Hi, may I know what's the solemnisation package like? Tried finding info online but didn't manage to get any.